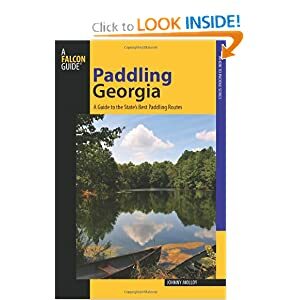 Paddling Georgia offers 38 trips covering the three primary regions of the state – North Georgia, Middle Georgia, South Georgia, plus Coastal Georgia. The paddles combine scenery, experiences, ease of access – including shuttling when necessary, and a reasonable length for day tripping. Each paddle included in the book is chosen as a day trip, though overnight camping can be done where noted. Each paddle offers an array of information desired to paddle Georgia, including the data box, which details county of paddle, starting and end points including GPS coordinates,, distance, paddle time, difficulty rating, type of waterway, river gradient, river gauges, land status, nearest town and other boats used. Driving directions follow. A paddle summary follows driving directions. This does what it sounds like it should do – it gives an overview of the paddle trip, giving you an idea of what to expect that will help you determine whether or not you want to experience this waterway. A river summary follows. This gives an overview of the entire river, not just the section paddled. Next comes The Paddle, which is the meat and potatoes narrative, giving you detailed information about your river trip, including flora, fauna and interesting not-to-be-missed natural features. It also details important information needed to execute the paddle, including forthcoming rapids, portages, bridges and stops along the way and the mileages at which you will come across them. After The Paddle comes a section known as Paddle Information, which gives you other things you need to know in list form, such as season, which gives the recommended times of year to execute the trip. Fees/permits tells whether or not your trip will require anything other than simply showing up. The Maps section list pertinent maps you can use for your paddle, though a valuable map is included with each paddle. The Organization section lists groups that charge themselves with taking care of the particular waterway included in the paddle. Contact/Outfitter listing will give you information if an outfitter operates on the segment of river given. Finally, each paddle has a sidebar. This is interesting information about the waterway that doesn’t necessarily pertain to the specific paddle but gives you some human or natural tidbit that may pique your interest to explore beyond the simple mechanics of the paddle. Photos are included with each paddle. * this book spares the reader the frustration of trying to find the right paddle in the right place. Johnny Molloy went out and paddled over Georgia, researching and finding the water adventures in which to enjoy Georgia’s varied waters. *Each paddle includes everything you need to know about executing your trip from put-ins to takeouts to river difficulty, river gauges and also whether outfitters are located on the waterway in case you’re looking for a shuttle. *the book uses the most up-to-date technology. The maps are GPS driven, put in and take outs include GPS map coordinates, it gives Internet addresses so you can check the river gauge for your chosen paddle for you get on the water rather than finding out too late that it is too high or too low. * The book covers not only the nuts and bolts information about executing your trip but also human and natural history of the area. This way you can learn a little bit about the natural wonders of Georgia and it’s fascinating past while enjoying some time on the water.